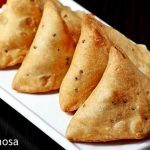 Samosa recipe – Samosa is a potato stuffed deep fried tea time snack that is very popular not only in India but also across Asian countries and the middle east. It is believed that they originated from the middle east and was brought to India by the Merchants. 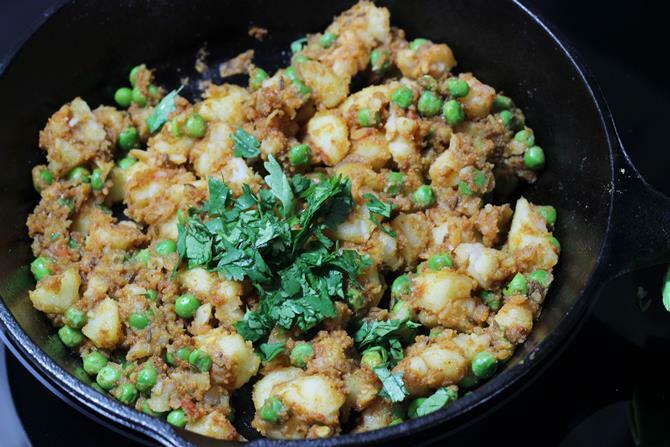 Most commonly they are made with potato stuffing but can also be made of keema/ meat. 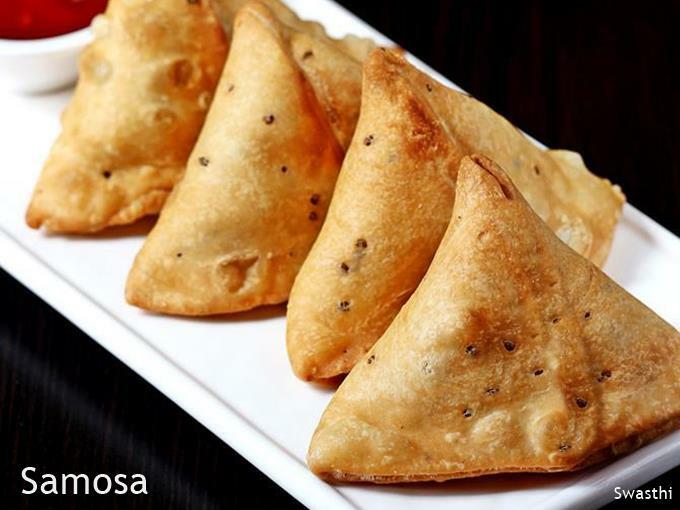 Samosa is one of the most commonly eaten snack across India. They are very special during the month of ramadan and are eaten as a Iftar snack. 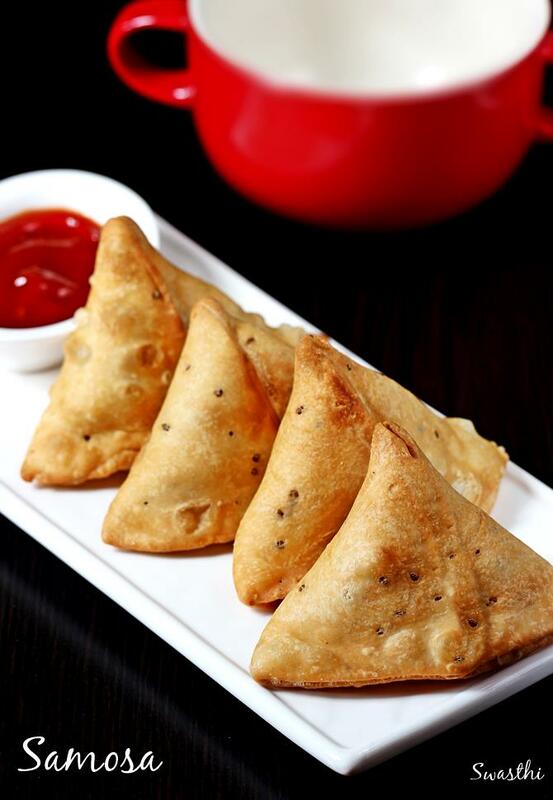 Samosas make their appearance everywhere as a street food, party snack, restaurants and even in cafes. I am sharing the samosa recipe with potato stuffing, you can also make keema samosa using this keema recipe for the stuffing. This Punjabi samosa recipe is roughly adapted from Chef Harpal singh. 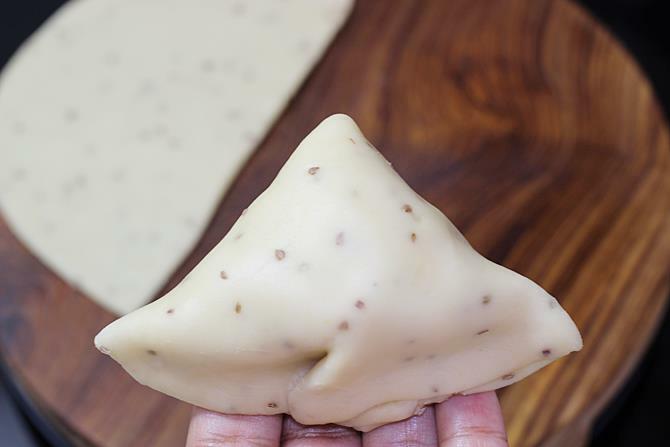 Tips for making the perfect samosa dough crust. This is useful in case you like to double or triple the recipe. 1. 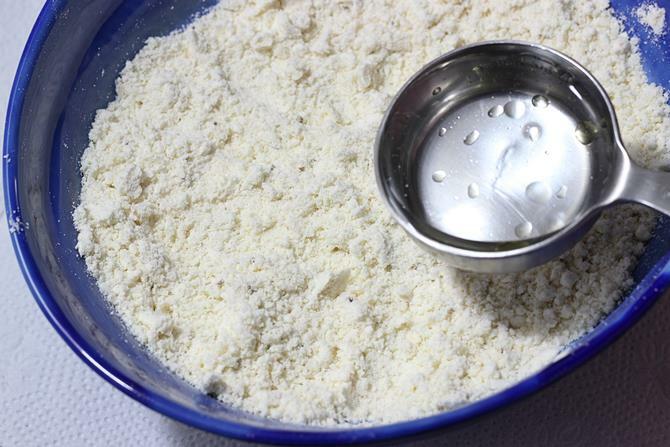 For every one kg of flour, you can use up to 200 grams of fat (oil or ghee). Anything more than this may break the crust. 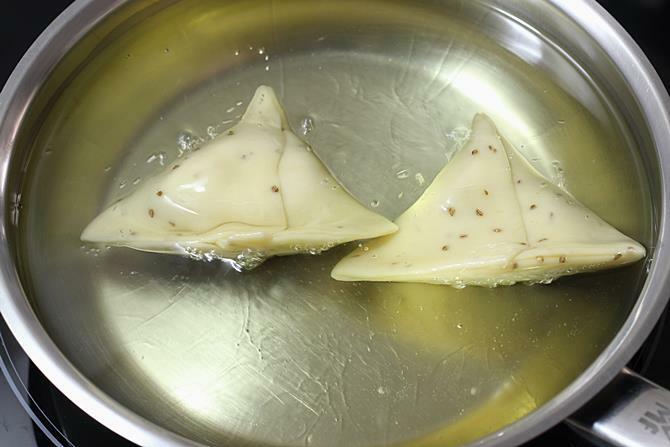 Using too little fats in the dough may lead to tiny air bubbles over the samosa. Can I bake these samosas? Yes. you can bake these at 170 to 180 C in a preheated oven for 35 to 40 mins. Yes you can. Read on to know the details. 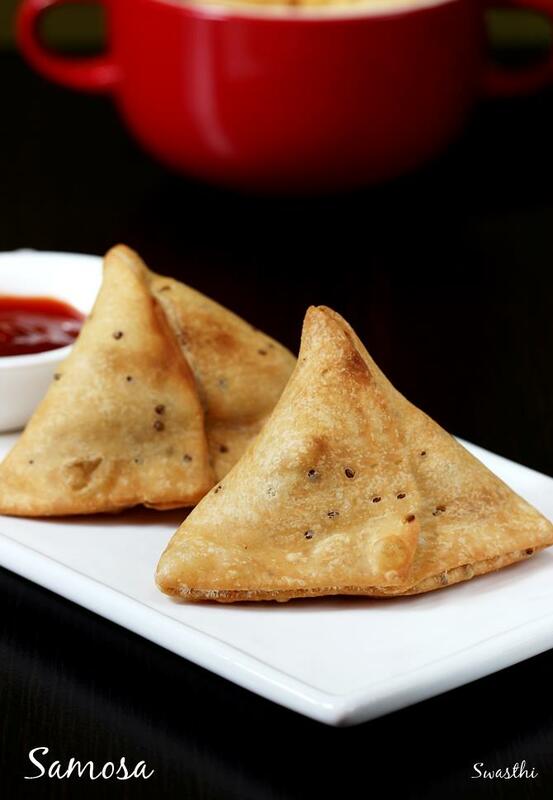 Punjabi samosa are crisp fried Indian snack with spicy potato peas filling. This recipe will give you flaky & crisp samosa that are full of flavors. Samosa is served with green chutney or mint chutney. Boil potatoes just until done. Crumble them, do not mash them up. Set aside. 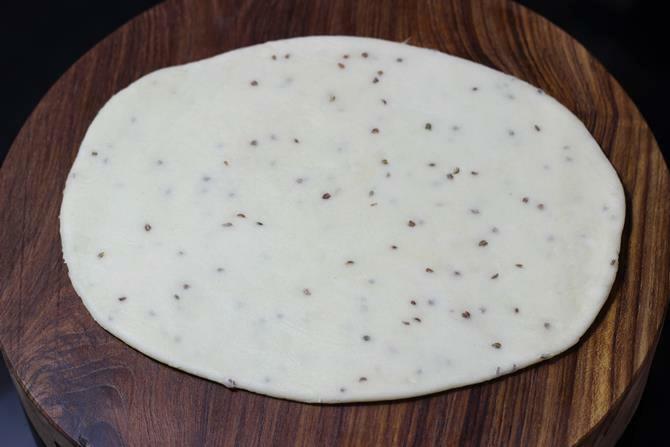 Mix together ajwain, salt, flour and ghee. Rub the flour well in between the palms to incorporate the ghee well. 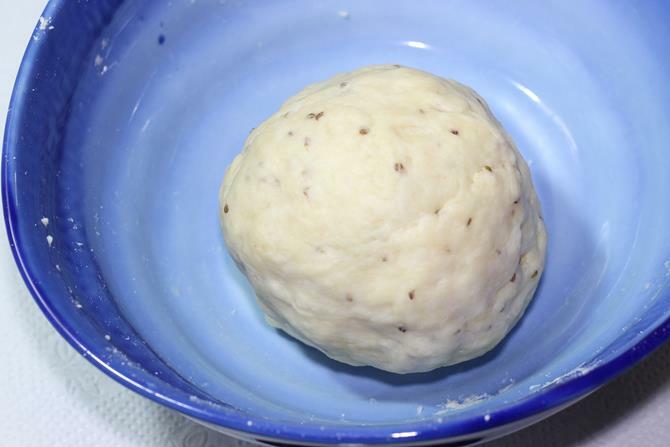 Add water little by little and mix the flour to dough kneading lightly. Cover and set aside until the filling is ready. Heat a pan with oil. 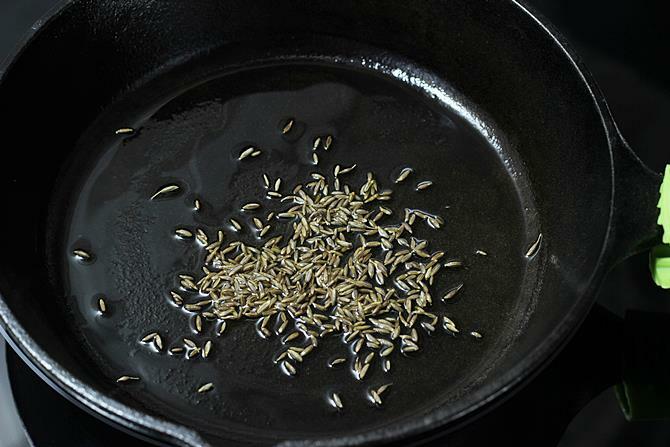 Add cumin. When it begins to sizzle, add ginger & fry until it smells good. Next add cashews and raisins if using. Fry for a while. Add in potatoes, chili powder, garam masala, amchur, anardana and salt. Mix and saute for 3 to 5 mins. Mix in coriander leaves & set aside to cool. Lightly knead the dough to smoothen a bit. 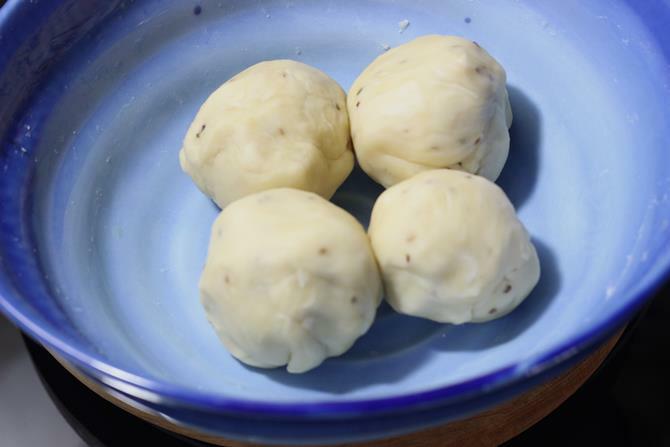 Make 4 to 5 portions and roll to balls. Cover the dough. Grease the rolling area and then flatten a ball. Begin to roll to a oblong or oval shape. Cut it to two. If the edges are too thick, gently roll it to thin down. Smear water over the straight edge. Join the edges to make a cone. Press gently to seal the cone. 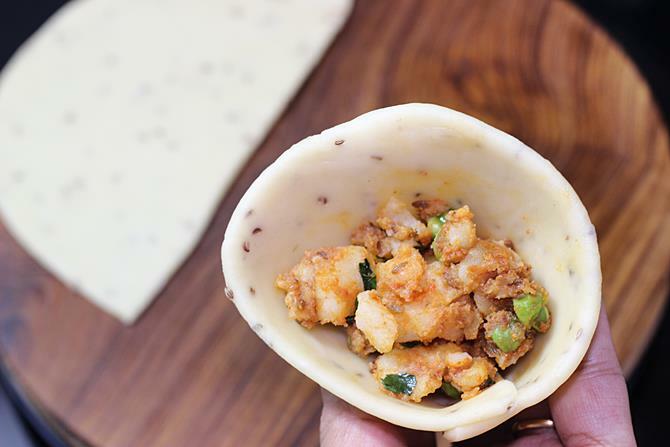 Fill the cone with potato masala and smear water on the edges. Bring the edges together and make a pleat on one side. Bring back the pleat and seal it. Make sure the samosa has been sealed well. Finish making all the samosas. Heat oil in a pan until medium hot. A piece of dough dropped in the hot oil must rise gently not immediately. This is the right temperature. Add the samosas to the oil and deep fry them until golden. When they are half fried you can increase the flame to little high and fry until crusty. Drain them on to a kitchen tissue. Fry all of them in batches. Preheat the oven at 170 C for about 20 mins. Bake these for about 35 to 40 mins. Serve samosa with mint chutney or tomato sauce. 1. 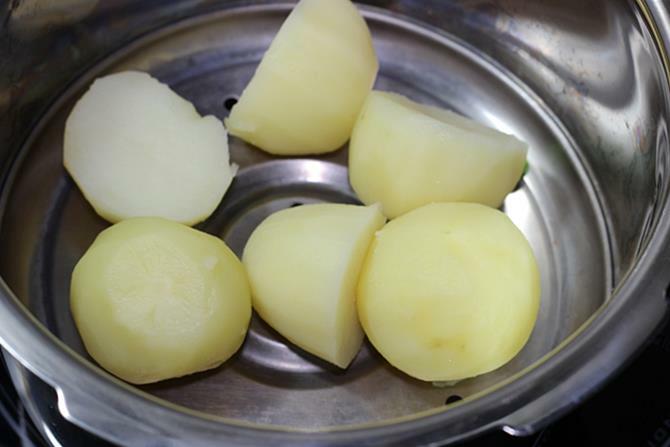 Wash and boil potatoes in whatever way you like. I washed peeled, halved and pressure cooked them for 1 whistle on a medium flame. 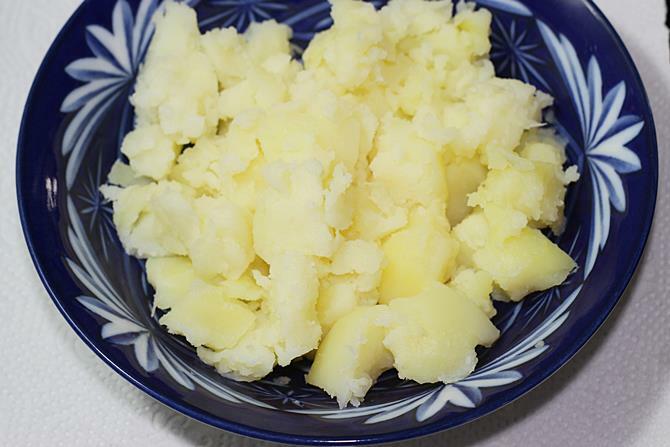 The potatoes should not turn mushy but must be fully cooked. 2. Cool and crumble them. Set aside. 3. Wheat flour or plain flour? Which is better for samosa? I have tried with wheat flour too but the results are not extraordinary. 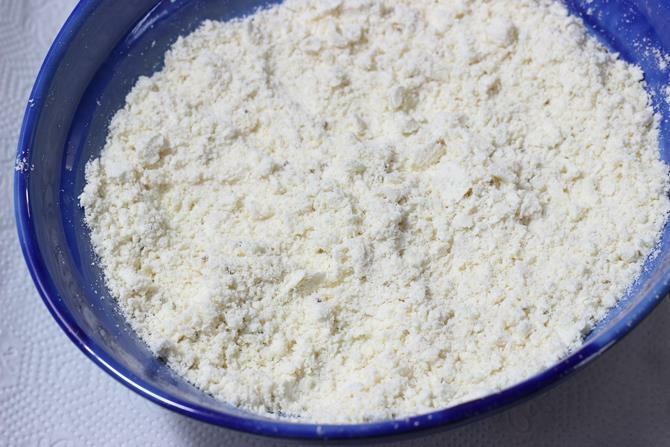 If you are into healthy eating and have completely stopped eating maida, then you can make with wheat flour. You can also use half wheat flour and half maida but all wheat flour does yield hard not very good samosa. I used organic plain flour / maida. For health reasons prefer organic flour or at least unbromated flour. 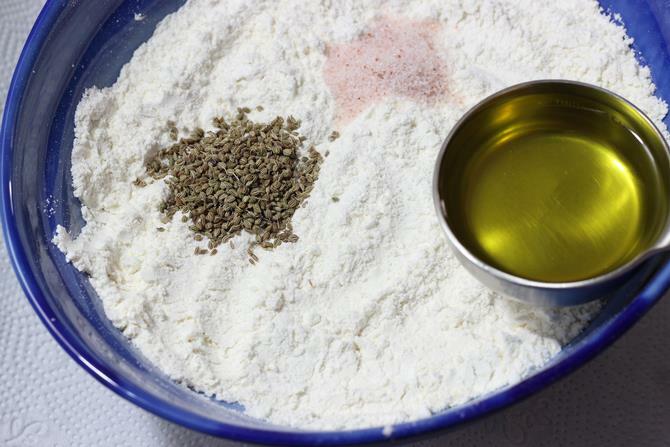 Add flour / maida, ajwain / carom seeds, salt and ghee to a large mixing bowl. You can also use half ghee and half oil. 4. Mix everything very well. Rub the flour in between your palms to incorporate the ghee well. 5. Add water little by little as needed. Knead it gently and make a dough. 6. 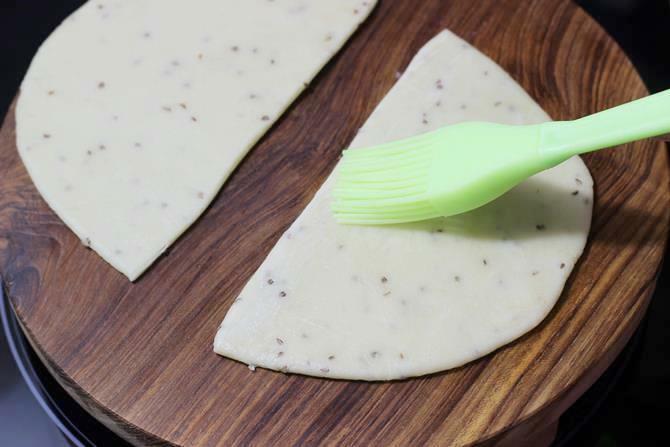 Dough has to be firm and not sticky. Cover and set aside until the filling is ready. 7. 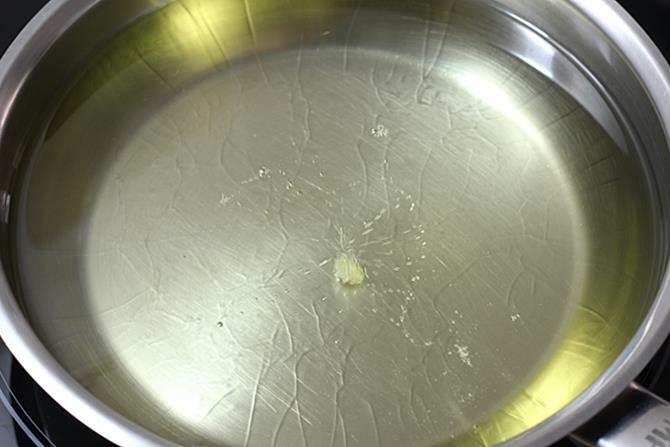 Heat ghee or oil in a pan. 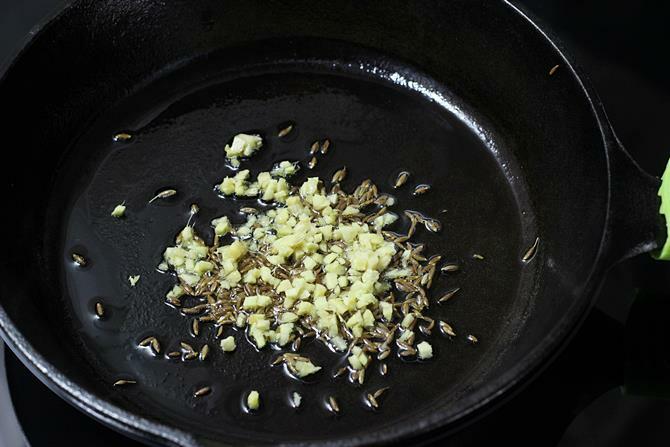 Next add cumin/ jeera and allow them to crackle. 8. Add minced ginger, green chili and saute until nice aroma comes out. Sprinkle hing. You can also use some cashews and raisins if you like. Saute until the nuts turn lightly golden. 9. 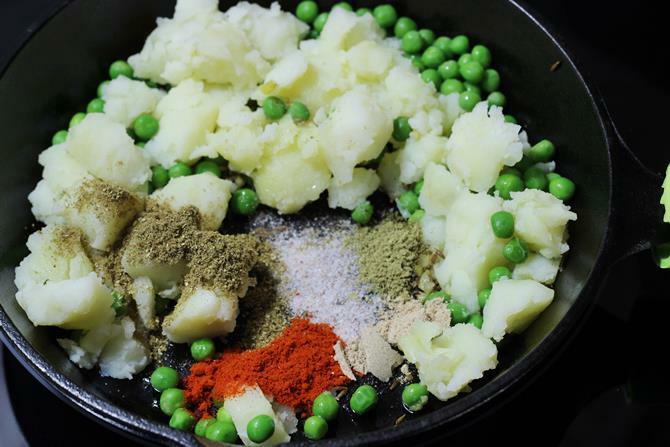 Transfer crumbled potatoes, green peas (optional), red chili powder, garam masala,salt, amchur powder and anardana (if you like). I prefer to add the spices in the oil. Saute everything well for 3 to 5 mins. 10. Add chopped coriander leaves and switch off the stove. Set aside to cool. 11. 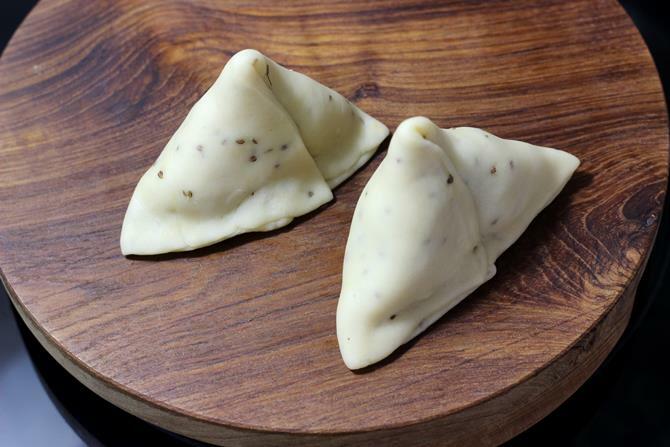 The recipe given below can make 8 to 10 samosas depending on the size. 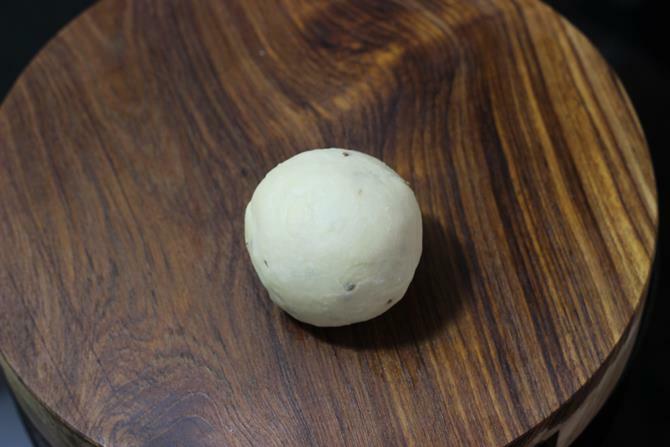 Knead lightly to smoothen the dough and then make 4 to 5 balls. I went ahead making 4 balls and got 8 samosas. 12. Oil the platform or the rolling board. Place the ball. 13. 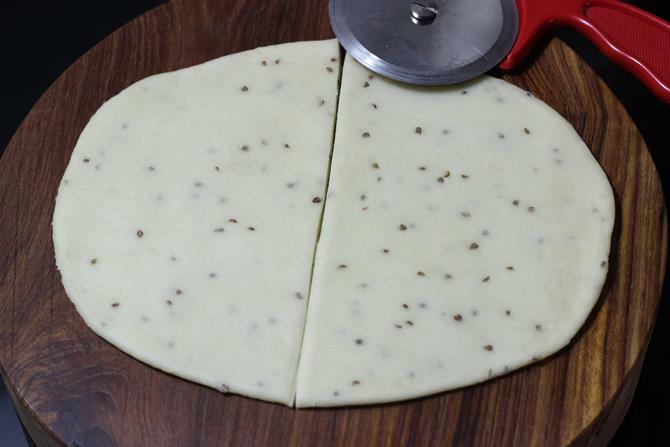 Roll it to a oblong or oval shaped even layer. 14. Cut it in the center to make 2 parts. 15. I prefer to roll the edges slightly to reduce the thickness. 16. Apply water with your finger to the edge. 17. Make a cone shape like you see in the picture. Stick the edges well. 18. Stick the edge from inside the cone as well. Fill the cone with potato masala. 19. Apply water on the edge. 20. Stick the edges. On one of the sides, make a pleat as shown in the image. 21. Bring the pleat to a side and stick it up. 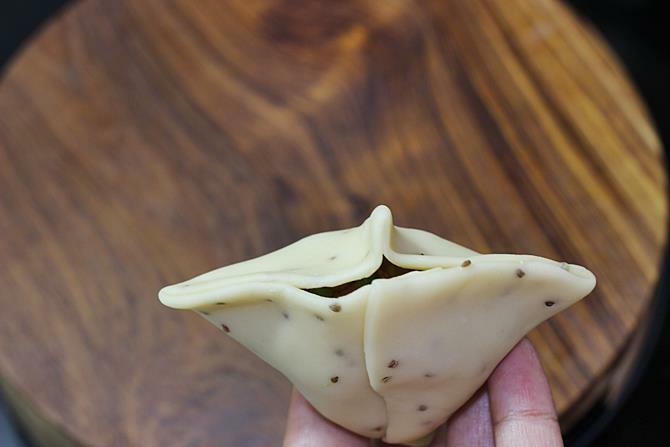 Make sure your samosa is sealed well. 22. They will stand perfectly. Finish making all your samosas. If you prefer to bake them, preheat the oven at 170 C in fan forced oven, at 180 C in regular oven for 20 mins. Brush oil generously and bake them for 30 to 40 minutes, flipping them after 15 minutes. 23. Heat a pan with oil for deep frying. The oil should not be very hot or smoky hot. It must be medium hot. When it is just getting hot, add a small portion of dough in the oil. It should not come up immediately and turn the dough golden. It must raise slowly up. This is the right temperature. 24. Add them one by one slowly. After you add them to the hot oil, you must see bubbles rising slowly. You should not be hearing any sizzling noise as it happens with the regular deep fried snacks. Keep stirring and fry them evenly until golden. Half way thru, I increased the heat. Drain them on a kitchen tissue when they are golden fried. For the next batch, reduce the heat completely and add them. Adjust the flame as needed. Pls enlighten me for this samosa recipe if you don’t mind. I need to make this for 100 pax and how do i measure the maida & oil please? Please also advise if i can make the samosa’s in advance and freeze them overnight before frying the next day? Bcz i need to make them early morning for serving at 7am. You are welcome. Thank you so much for the wishes. Happy to know the recipes turned out good. Firstly I am not sure if you can freeze these and use. I haven’t tried them that way. The simplest way to make 100 samosas would be to use the pastry sheets or spring rolls from the frozen section. I don’t have anyone here with me to help in the samosa making. Hence, i would follow your suggestion on the pastry sheets. 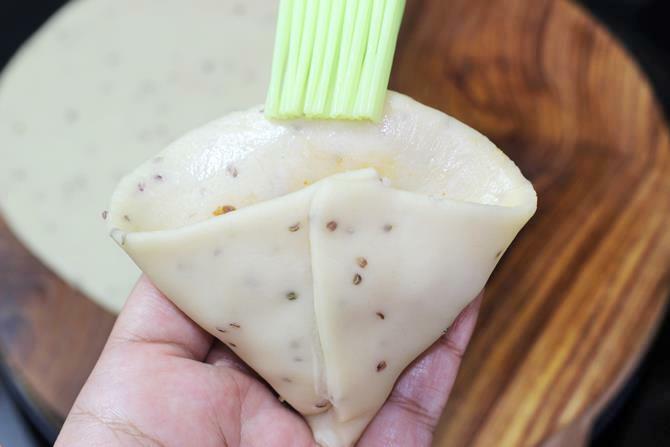 So, if i were to use the pastry sheets, i can make the filling and do the stuffing ( make the samosa) and freeze them 1 day in advance and just need to tke them out and thaw before frying the mext day? Is that correct? I am an experienced cook but behave like a novice and follow you blindly and am always successful, thanks to your excellent instructions. God bless you for sharing your time and knowledge. Today I tried this samosa recipe and now I am sure I will be making this every week. My family loved it and I have been asked to make double the quantity tomorrow. Lots of love to you and God bless. You are welcome. Thanks a lot for the wishes & love. So glad to know the samosas turned out good. Whenever I have to cook something new, youand your receipt is the key to my cooking. I really love your way of writing the whole recipe and you make the whole dish look easy and doable. Anyone and everyone can make it. Till now all my attempts have been successful. And this is all because of you. Great job! Keep up the good work! Thanks a lot for the wishes. So happy reading your comment! Just made them and the whole family loved them ! Thanks for the recipe ! Thanks for trying. Happy to know samosas were loved by all. I have made a few of your recipes. They were easy to follow and very tasty. Hai ! 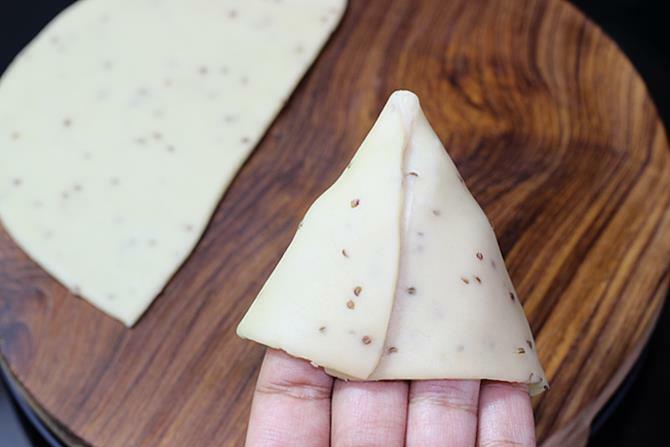 samosa preparation is very simple. I will try and eat. thanking you ! Hi swasthi, today m going to try making samosas on my daughter’s demand. Just want to know that what is te difference between fried and baked samosas? If there is no taste difference I want to try baked one. 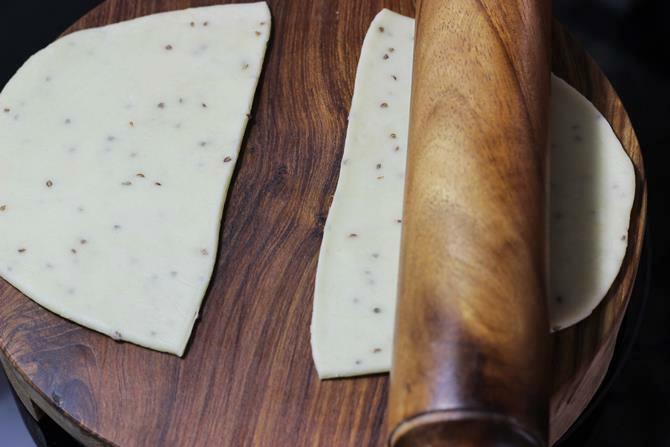 Give your tips for baking. Planning to make it today on my daughter’s demand. So your prompt response will be helpful. Since samosa is not something we make often I would suggest making the fried ones. Yes there is a difference between the baked ones and fried ones. Samosas are best when fried. If you eat fried foods daily and want to cut down that then you may want to bake them.. You will have to brush them generously. For the entire recipe you may need about 3 tbsp oil. Hope your little one will love them. you are welcome. Thank you so much for trying. Glad to know Prisha enjoyed the samosas. I always wanted to make samosa with a good thick flaky crust and this recipe helped me the best. Thank you for the good work. Thanks for this great recipe …. Thanks for trying. I guess frying them on a very low flame for long makes them hard. Yes I can share the recipe. I just need some time.